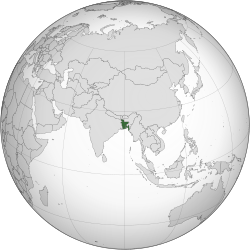 Bangladesh is a country in Southern Asia. Bangladesh is a new state in an ancient land. Like the rest of Southern Asian states, it has been described as continually challenged by contradictions, marred by inconsistencies to say the least. It is neither a distinct geographical entity, nor a well-defined historical unit. Nevertheless, it is among the 10 most populous nations; a place whose search for a political identity has been protracted, intense and agonising. It borders the North-east Indian provincial regions of the Republic of India, of which is almost entirely encircled by the latter, and converges with Southeast Asia to the east proper. The capital and the largest city is Dhaka (was also spelled 'Dacca'). Bangladesh is surrounded on all three sides by the Republic of India (Bharat), and borders Myanmar (Burma) on the south-eastern corner, it is in close proximity to the People's Republic of China, Bhutan, Sikkim and Nepal. Main gallery: National symbols of Bangladesh. This page was last edited on 12 December 2018, at 07:46.